This week I wrote a blog post for the Cambridge Centre for Climate Science (CCfCS). It’s a summary of an afternoon of talks about the IPCC 5th annual report on climate change. The event was organised by both the CCfCS and the Cambridge Institute for Sustainable Leadership (CISL). UPDATE: the link to the website has broken so I have copied and pasted my report below. A more detailed summary of both Working Group 1 (The Scientific Basis) and Working Group 2 (Impacts and Adaptation) can be found in previous posts I’ve written. This week the Cambridge Centre for Climate Science (CCfCS) and the Cambridge Institute for Sustainable Leadership (CISL) hosted an afternoon of presentations and discussions about the 5th Intergovernmental Panel on Climate Change (IPCC) report (AR5). The meeting coincided with the release of the ‘Synthesis’ report which was the final document to be released for AR5. The meeting was organised by Dr Michelle Cain (CCfCS) and chaired by Dr Eliot Whittington (CISL). Four speakers spoke about the three working group reports and the IPCC’s impact on policy. A panel discussion followed where audience members could ask questions and give comments. Lastly, the afternoon concluded with an opportunity for networking over a wine reception. The first of the four speakers was Prof. Eric Wolff from the Department of Earth Sciences, formally from the British Antarctic Survey. Professor Wolff gave a clear summary of the working group (WG) 1 report which assesses ‘The Physical Science Basis’, as well as a brief overview of the history of the IPCC. The IPCC is a UN indorsed organisation set up by the United Nations Environment Program (UNEP) and the World Meteorological Organisation (WMO) in 1988. The published reports released every ~5 years aim to assess “the scientific, technical and socio-economic information relevant to understanding the scientific basis of risk of human-induced climate change“. WG1 discusses both past and present observations are conducted, and how the use of complex computer models help to understand the climatological processes occurring in the world. Observations including sea ice extent, atmospheric and ocean temperature, ocean acidity and sea level show concurrently the world is warming. The rate of change is at least 10 times faster than the warming from the last ice age. 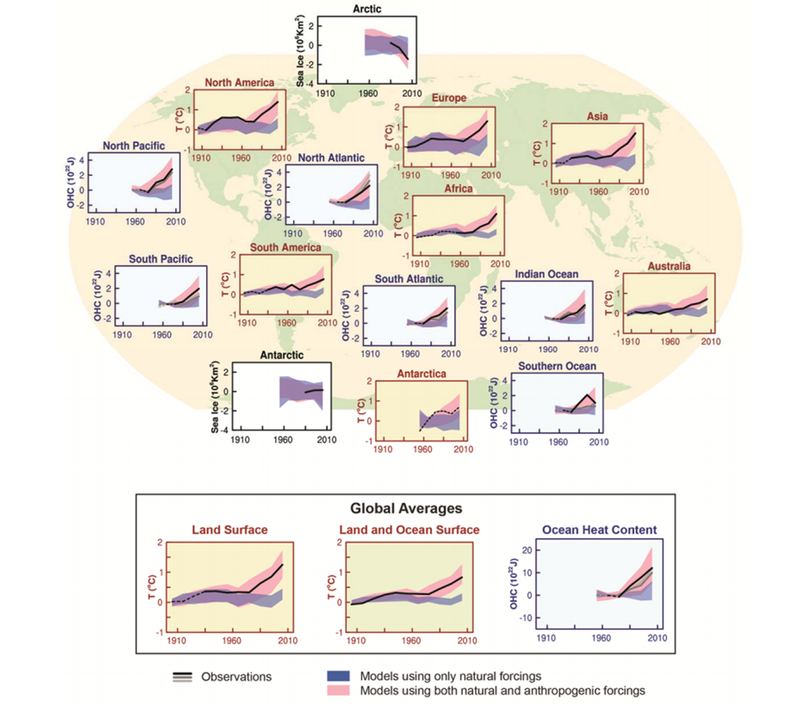 Computer analysis shows that these observed changes cannot be replicated without the consideration of anthropogenic interactions to the environment (i.e CO2 has risen 40% in the last two centuries). Future ‘pathways’ the world can adopt show at least a 2 degree warming by the year 2100, if an aggressive strategy is adopted to reduce GHG emissions. A ‘business as usual’ pathway shows an increase of 4-5 degrees. This would have major impacts on the world as the last ice age was only 5 degrees cooler than today. The second speaker was Prof. Douglas Crawford-Brown from the Cambridge Centre for Climate Change Mitigation Research who summarised the WG2 report: Impacts, Adaptation and Vulnerability. Five themes (listed below) regarding impacts were addressed in this report. The report was criticised however for not addressing each theme with equal weighting. Both global and regional impacts were addressed and the idea of ‘risk’ was commonly used as an analytical framework throughout the report, whereas in 2009 the AR4 WG2 report concentrated more on pure relevance scenarios. Future impacts were discussed using the same pathways described in the WG1 report. A region’s vulnerability and ability to adapt was also assessed. The WG3 report: Mitigation of Climate Change, was summarised by the third speaker Dr David Reiner from the Energy Policy Research Group in the Judges Business School. Dr Reiner started his talk by advising that for this WG the technical summary (TS) which, although longer, provides a more detailed analysis of the scientific data than the summary for policy makers. The report starts by explaining that GHG emissions are continuing to rise on the global scale despite many reduction policies in place. This is due to increasing emission rates from more developing nations. Dr Reiner explained that the primary purpose of WG3 was to assess multiple mitigation pathways and its impact on the economy. Global baseline projections for the Kaya factors (population, GDP per capita, energy use per unit of GDP, carbon emissions per unit of energy consumed) were also shown in the report. An attempt to quantify the economic cost of mitigation strategies and other co-benefits to reducing GHG emissions (e.g better air quality) were also highlighted. Of the three working group reports, the third was the least well reviewed after publication, with the economic models being questioned. This was also mentioned in the final speaker’s talk ‘A policy perspective on the IPCC’ by Prof David MacKay who was the former chief scientific advisor to the Department for Energy and Climate Change (DECC), and now works in the Engineering Department of Cambridge University. Professor MacKay provided constructive criticism for some areas of improvement for future reports. The quantification of risk and the clarification of uncertainty were stressed to be particularly useful for determining future policies. A panel discussion, lasting ~90 minutes, allowed the audience to ask questions and offer comments. Topics including carbon sequestration, the format of future IPCC reports, the role of both public and private sectors in CC mitigation, and the portrayal of scientific facts and figures were all addressed. Less formal discussions then continued at the wine reception. Last week the UN 2014 Climate Summit was hosted in New York. The purpose of this meeting was “to raise political momentum for a meaningful universal climate agreement in Paris in 2015 and to galvanize transformative action in all countries to reduce emissions and build resilience to the adverse impacts of climate change”. Various marches all around the world were also organised to coincide with this summit to raise public and political awareness of the meeting. The UN Secretary General Ban Ki-Moon gave the closing summary speech which is available to read on the United Nations Framework Convention for Climate Change (UNFCCC) website. His summary includes details on various pledges by member states to cut emissions and to aid economical growth world wide. It’s worth a read if you have a chance. 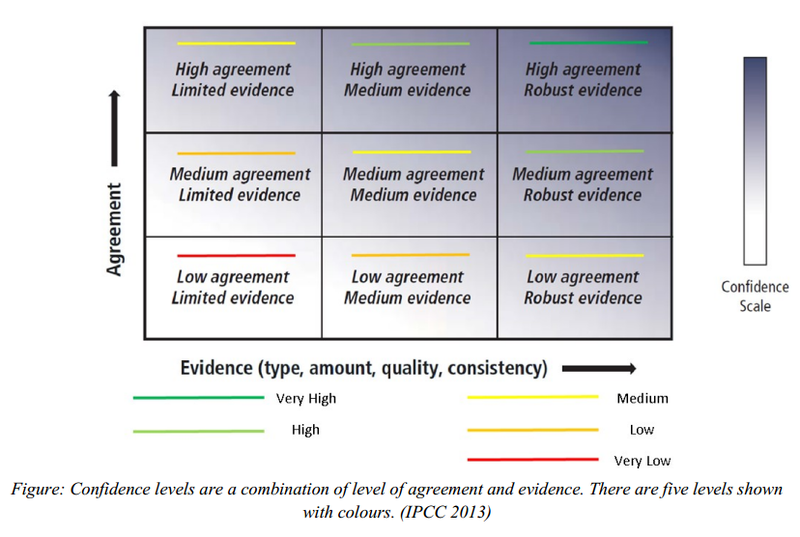 The IPCC (Intergovernmental Panel on Climate Change) consists of three working groups who publish reports every 6 years describing the current understanding of all aspects of climate change (CC). The previous blog post (Key Figures from the IPCC’s AR5 Report) gives an introduction into the IPCC and explains the key figures published by the First Working Group last winter which concentrates on the scientific evidence of CC. This blog post summarises the highlights from the Second Working Group (WG2) which aimed to assess the risks associated with CC, particularly Impacts, Adaptation and Vulnerability. WG2’s Summary for Policy Makers, which this post is based upon, assesses relevant scientific, technical and socioeconomic literature. Such literature is comprised of empirical observations, experimental results, process-based understanding, statistical approaches, simulation and descriptive models as well as expert judgement. NB: For descriptions of the confidence and certainty values mentioned in this post please see this previous post on the WG1 report. 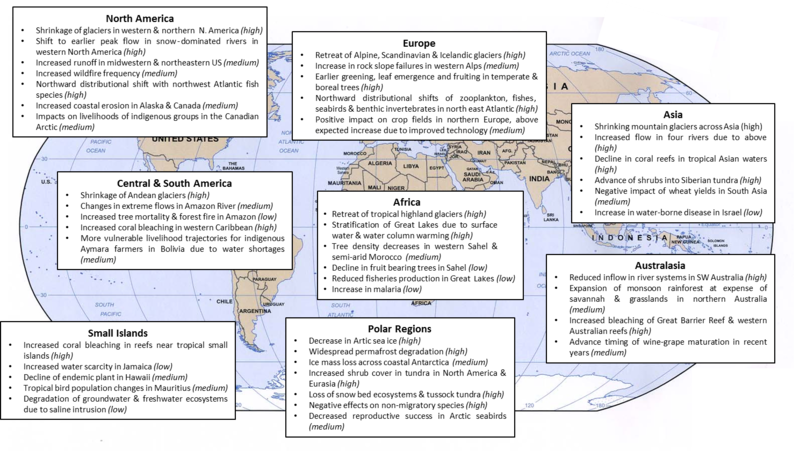 The figure below summarises the observed impacts around the world in the last few decades. A hollow symbol means that the evidence suggests CC has had a minor impact, and a filled symbol represents a major CC contribution. The rectangular bars beside each symbol represent the confidence associated with each impact. A summary of the major themes found throughout the impacts stated on this map are listed below. All statements are stated to have high or medium confidence levels. Changes in precipitation or melting snow / ice is altering some regions’ hydrological systems, which can affect water resources and quality. Many species have shifted their geographic ranges, seasonal migration times, abundances etc. A few species have become extinct due to current CC. Negative impacts of CC on crop yields currently outweigh positive impacts. Positive impacts are mainly localised to the Northern hemisphere higher latitude regions. Currently, the impact of CC on worldwide human health is minimal when compared with other contributing factors. It should be noted that there has been an increase in heat related mortality and a decrease in cold related mortality. Climate extremes, for example, heat waves, droughts, floods (which are expected to increase in the future) are a significant vulnerability for some ecosystems. Climate related hazards aggravate other stressors that impact human life, especially for people living in poverty. For example, food price increases due to lower crop yields. Observed positive impacts are limited and often indirect, for example, diversification of agricultural practices. Widespread impacts in a changing world. 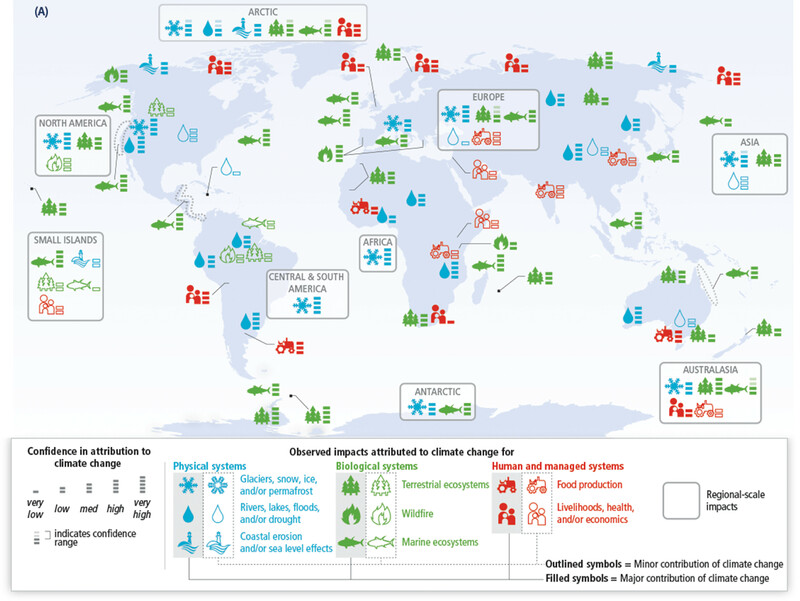 (A) Global patterns of impacts in recent decades attributed to climate change, based on studies since the AR4. Impacts are shown at a range of geographic scales. Symbols indicate categories of attributed impacts, the relative contribution of climate change (major or minor) to the observed impact, and confidence in attribution. The following diagram shows regional examples of the impacts described in the previous paragraph. For a more comprehensive list of impacts please see the Summary for Policy Makers Table 1. All statements listed below have confidence levels shown in brackets after each impact. The figure below shows the average percentage change in crop yield. 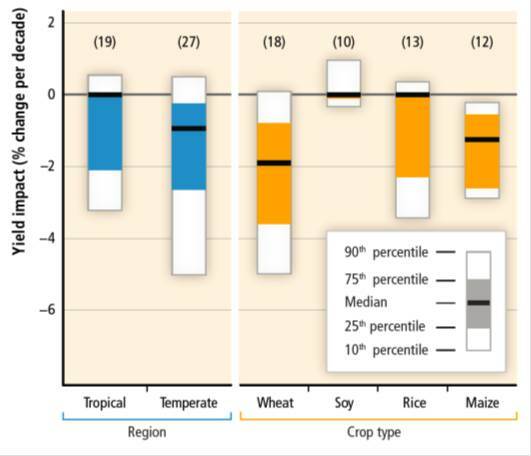 The two blue bars to the left show all crops grouped as growing in tropical or temperate climates. The four orange bars on the right are the most common crops worldwide. It has been observed on the whole that CC has had a negative impact on yields of most crops worldwide. (C) Summary of estimated impacts of observed climate changes on yields over 1960-2013 for four major crops in temperate and tropical regions, with the number of data points analyzed given within parentheses for each category. The second half of the summary for policy makers concentrates on the future risks and possible benefits CC will bring to the world. The magnitude and rate of CC is also taken into consideration. The IPCC Working Group 1 used four representative concentration pathway (RCP) scenarios to predict the average global temperature leading up to 2100. For definitions of the RCP scenarios please read my last post. 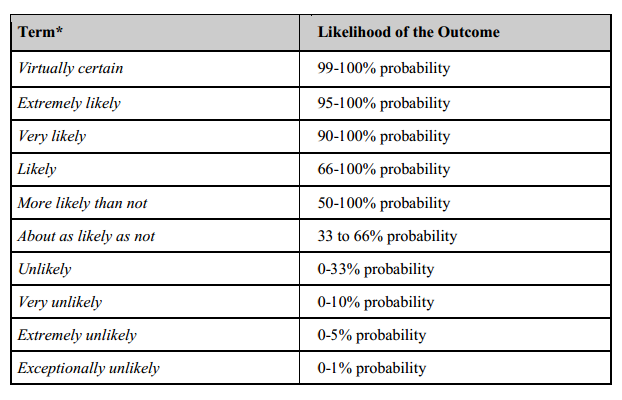 The following risks predicted by the WG2 all occur in at least one of the RCP scenarios and all possess high confidence levels. Risk of death, injury, ill-health, or disrupted livelihoods in low-lying coastal zones and small island developing states and other small islands, due to storm surges, coastal flooding and rising sea level. Systemic risks due to extreme weather events leading to breakdown of infrastructure networks and critical services such as electricity, water supply, and health and emergency services. Risk of increases in mortality and disease during periods of extreme heat, particularly of vulnerable urban populations and those working outdoors. Risk of food insecurity and the breakdown of food systems linked to warming, drought, flooding, and precipitation variability and extremes, particularly for poorer populations in urban and rural settings. Risk of loss of rural livelihoods and income due to insufficient access to drinking and irrigation water and reduced agricultural productivity, particularly for farmers and pastoralists with minimal capital in semi-arid regions. Risk of loss of marine and coastal ecosystems, biodiversity, and the ecosystem goods, functions, and services they provide for coastal livelihoods, especially for fishing communities in the tropics and Arctic. Many key risks constitute particular challenges for the least developed countries and vulnerable communities, given their limited ability to cope. Freshwater resources: Risks increase significantly as concentrations increase (robust evidence, high agreement). Renewable surface- and groundwater resources are expected to decrease over the 21st century especially in subtropical dry regions which would intensify competition for water supply (limited evidence, medium agreement). Terrestrial & freshwater ecosystems: Both ecosystems are expected to have a large fraction facing extinction risks during and beyond the 21st century. This is because CC can have an impact on other factors such as pollution, invasive species etc. (high confidence). There is also the risk of abrupt and irreversible regional-scale change in the higher RCP scenarios (medium confidence). Coastal & low-lying areas: Rising sea levels are predicted throughout the 21st century. Coastal and low-lying areas will therefore increasingly experience adverse impacts such as flooding and coastal erosion (very high confidence). Marine systems: Global marine-species redistribution and marine-biodiversity reduction will challenge the sustained provision of fisheries productivity (high confidence). 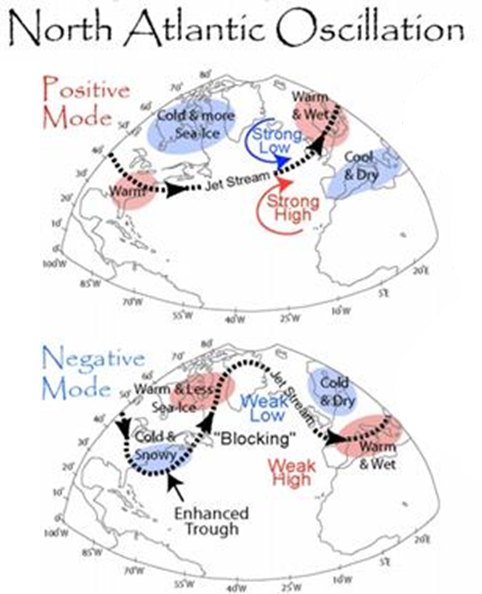 For medium to high RCPs, ocean acidification will cause substantial risks particularly to coral reefs and polar regions (medium – high confidence). Food security & food productions systems: Major crops will see a negative impact on production without adaptation, however individual locations may benefit (medium confidence). All aspects of food stability are affected by CC, including food access and price stability (high confidence). Urban areas: Urban areas are affected by many CC risks (medium confidence). Risks are amplified for those lacking appropriate infrastructure, those in poor quality housing and in exposed areas (medium confidence). Rural areas: Rural areas are exposed to both near- and long-term risks from CC. These impacts include water availability, supply and food shortages (high confidence). Key economic sectors & services: For economic sectors, other stressors, including population, technology, relative prices etc. will be larger than the impacts of CC (medium confidence). Global economic impacts from CC are very difficult to estimate. The most recent, but still incomplete, estimates predict an increase of ~2 oC would have a negative economic effect of between 0.2 and 2 % of income (medium evidence, medium agreement). Human health: Until mid-century CC will impact human health by exacerbating current health issues (very high confidence). It is expected to increase throughout the 21st century in many regions, especially developing countries with low income (high confidence). Human security: The displacement of people is expected to change due to CC (medium evidence, high agreement). CC can increase violent conflicts in the form of civil war by amplifying well-documented drivers of these conflicts such as poverty and economic shocks (medium confidence). Livelihoods & poverty: Throughout the 21st century CC is expected to reduce economic growth, make poverty reduction more difficult and further erode food security (medium confidence). The following diagram shows how the Earth’s temperature has changed in the last ~110 years (Part A). Any area with insufficient data was left white and any statistically insignificant temperature change is shown with hatched lines. 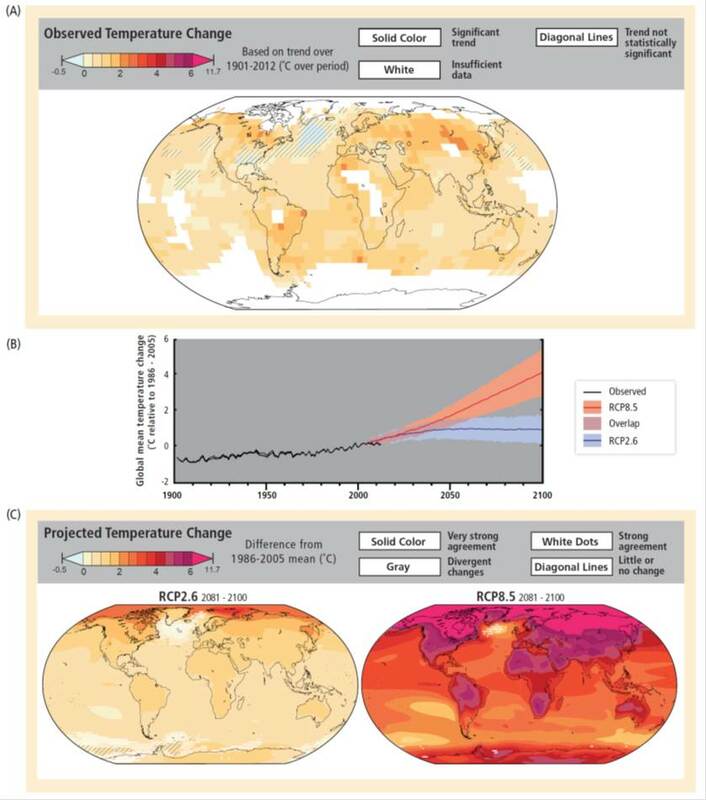 The second diagram in the figure below (B) shows two of the RCP scenarios and how the world’s average temperature could increase whilst following these scenarios. The blue is considered the ‘best case’ scenario where countries adopt a very strict reduction of greenhouse gas (GHG) emissions whereas the red is a ‘carry on as normal’ scenario. 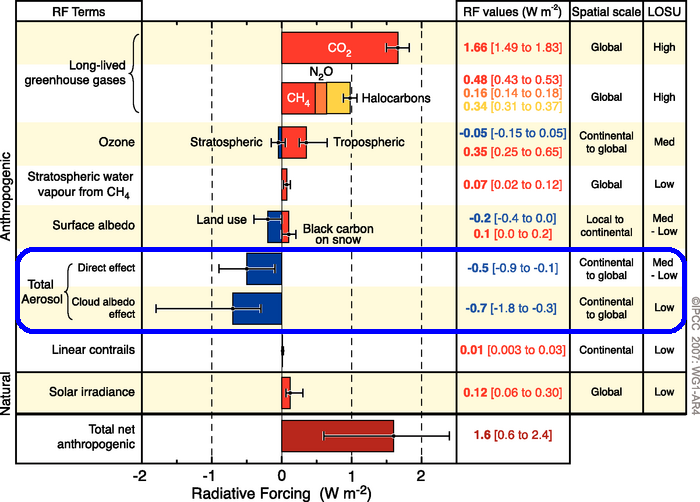 The third part to this figure (C) shows two plots much the same as in part A but the two RCP scenarios have been used to show how the Earth’s surface temperature can change depending on what mitigation techniques are adopted. 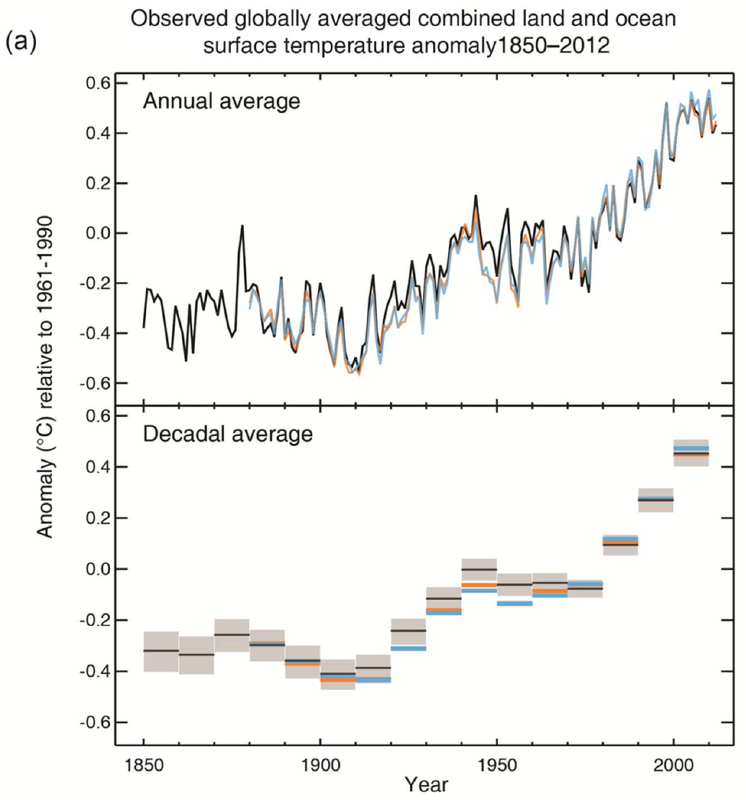 The percentage temperature increase is taken from the average of the Earth’s temperature from 1986-2001. 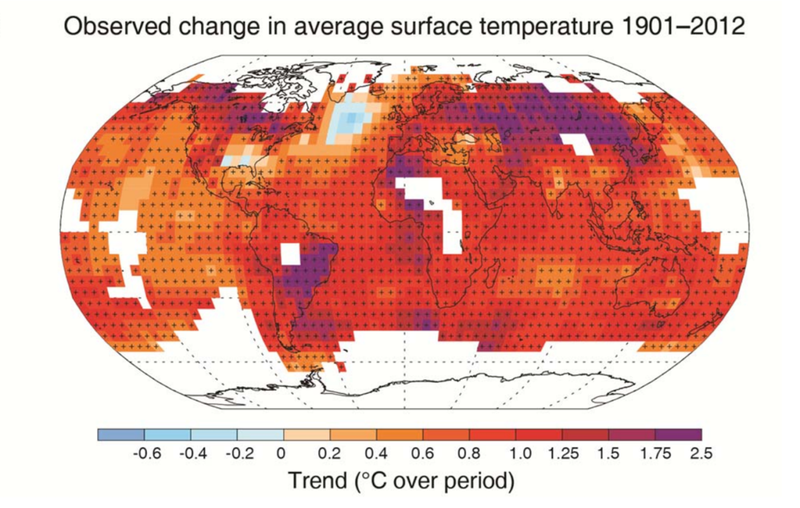 The key things to note from this figure is how dramatically different the future climate could be and how uneven the warming across the world is (for example, the Northern Hemisphere warms much more than the Southern Hemisphere). figure informs understanding of climate-related risks in the WGII AR5. It illustrates temperature change observed to date and projected warming under continued high emissions and under ambitious mitigation. The final figure in this post shows the possible changes to fishing by the middle of this century. 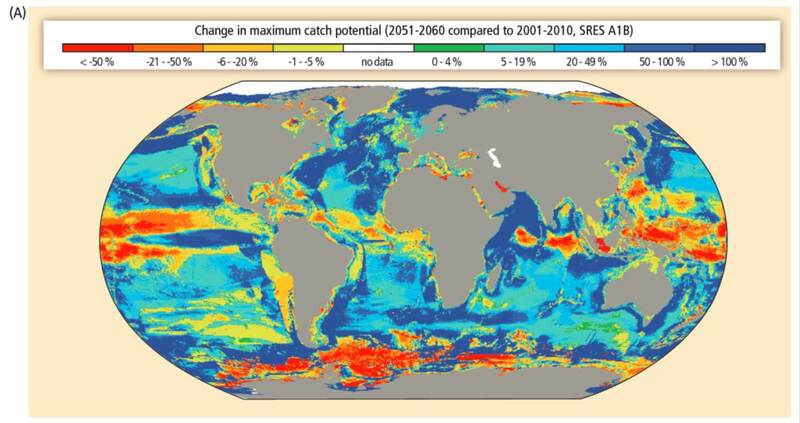 The plot shows the redistribution of the maximum catch potential for over 1000 fish species caught worldwide, and is compared to the 2001-2010 baseline value. The values calculated here are based upon one of the more extreme RCP scenarios. Coastal regions and seas in north-western Europe and other mid- to high-northern latitudes will see an increase in maximum catch potential as more warm-water species migrate northwards. There will be a sharp decrease in maximum catch in the equatorial regions and around the South Pole with differences being as small as half the expected value of the 2001-2010 mean. Climate change risks for fisheries. (A) Projected global redistribution of maximum catch potential of ~1000 exploited fish and invertebrate species. Projections compare the 10-year averages 2001-2010 and 2051-2060 using SRES A1B, without analysis of potential impacts of overfishing or ocean acidification. The IPCC WG2 also goes into detail about adaptation strategies however these have not been covered in this blog post. For more detail on this I suggest Section C of the Summary for Policy Makers. The third and final report by the Working Group 3 (WG3) has been published, and concentrates on potential mitigation choices – the subject of my next post. The El Niño Southern Oscillation (ENSO) is a natural phenomenon that occurs in the Pacific Ocean around the equator every 2-7 years. Weather systems on the West Coast of the Americas, the East Coast of Australia and East Asia can all be affected by this phenomenon. 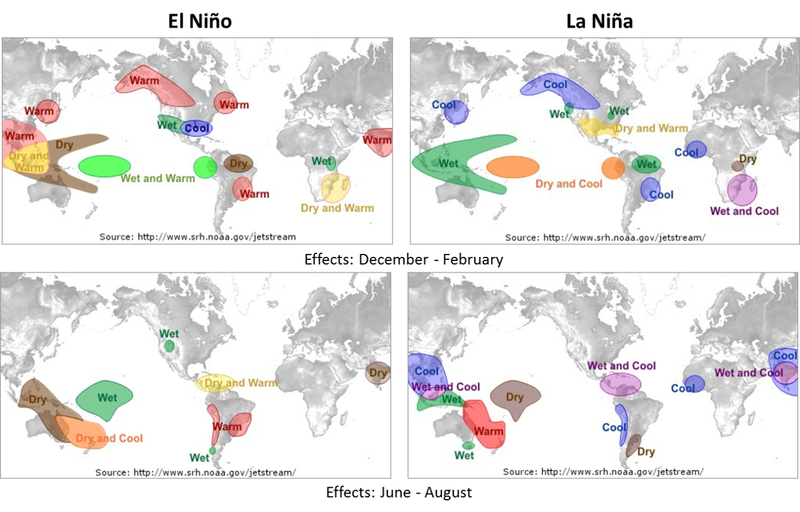 The ENSO oscillates between two phases: El Niño and La Niña (meaning ‘the boy’ and ‘the girl’ respectively in Spanish. The boy can also be a specific reference to the Christ child. I am unsure why they were named this however!). These phases are the two extremes of this oscillation. To explain them in more detail I first need to explain the ‘normal’ state of the Tropical Pacific Ocean. The eastern Pacific normally has atmospheric higher pressures than the west, this causes easterly winds (from the Americas to Australia) blowing along the equator. These winds take with them warm moist air which rises up and turns into rain. This elevated air then travels back to the east creating the ‘Walker circulation’. A diagram showing this circulation is shown below. The winds blowing westwards move the warm sea surface water. This then causes the deeper (and colder) water to rise up to the surface in the east producing a temperature gradient along the equator. The Walker circulation is responsible for countries like Indonesia experiencing warm downpours of rain, especially in the northern hemisphere winter months. However, when ENSO is in its El Niño phase the areas of high and low pressure reverse, therefore changing the wind direction. This drives the warm sea surface waters back to the east, taking with it the rain. The La Niña phase is when the ‘normal’ conditions are more extreme, i.e. the easterly winds are even stronger and the pressure difference is even greater. This means even more warm water is moved towards Australia and East Asia. 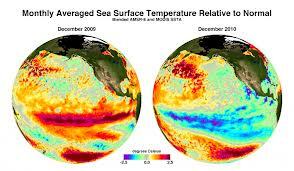 The diagram below shows the sea surface temperature anomalies for El Niño (left) and La Niña (right) events. El Niño has higher than average temperatures because the warm water has been moved back towards the east whereas La Niña shows the surface is much colder than average as all the warm water has been shifted even more westward. Original can be found here. ENSO affects the weather systems of the world in different ways, many of which are summarised in the diagram below. Unlike the North Atlantic Oscillation which was the subject of my last blog (please click here to see) this oscillation does not directly influence Europe’s weather. El Niño years tend to give a warmer global temperature average especially in the winter, whereas La Niña years will give cooler than average winters. It is also thought that during La Niña events more tornadoes are experienced, although no mechanism for this has so far been provided . The video below is a basic but well explained summary of how ENSO affects the weather in Australia and is worth a watch. 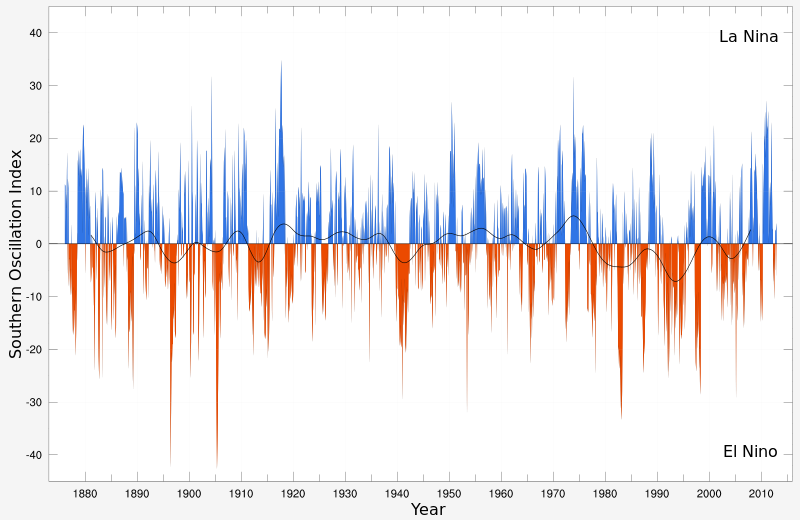 The intensity of the El Niño / La Niña phase can be quantified by an index where positive and negative values represent La Niña and El Niño respectively. A time series for the last ~130 years is shown below. In the future, as a result of global warming, it is predicted that there may be more El Niño events, as in recent decades, however more observational data is needed to improve the confidence of these results. The final video below is an overall summary of ENSO, and helps to visualise the oscillation more clearly. It’s a little over 4 minutes long but you miss nothing by skipping the first 25 seconds. A brief introduction to aerosols..
Let’s skip the chit chat and go straight into post number three… Spray-cans will come to mind for many people when they first think of aerosols, but this term has a much more general meaning and plays an important role in climate science. Anything that has a suspension of liquid or solid in a gas is deemed an aerosol. In fact, a spray-can may actually contain hundreds of different individual aerosols. A simple demonstration that shows the significance of aerosols in the atmosphere is the ‘cloud in a bottle’ trick. A trickle of water is added to an empty bottle and the cap put on. By just shaking and squeezing the bottle (simulating pressure changes that occur every day in the Earth’s atmosphere) no cloud is formed. However, if smoke is added, from a blown out match for example, and then the bottle squeezed, a small vapour cloud becomes visible – try it yourself or see the video of it below! These tiny particles – aerosols – are necessary for clouds to form anywhere in the world. 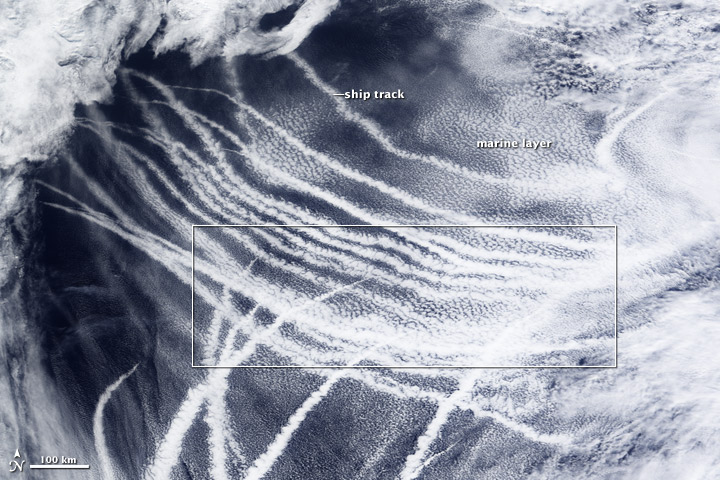 The photograph below shows how clouds have formed from aerosols released by ships. Aerosol sources can be both natural and anthropogenic. The photo above is an example of industrial aerosol emissions but other major sources can include deserts (in the form of dust and sand) and from fires / biomass burning, which can be both natural and manmade, even tiny ice crystals can be classed as aerosols. One of the global climate models, Global Earth Observing System Model – Version 5 (GEOS-5) has simulated the emissions and transportation of all major aerosols from September 1st 2006 to March 17th 2007 and the video can be seen below. For a description of the colours see the figure description. Aerosols have both positive and negative radiative forcing effects (for more information on radiative forcing please read my first post! 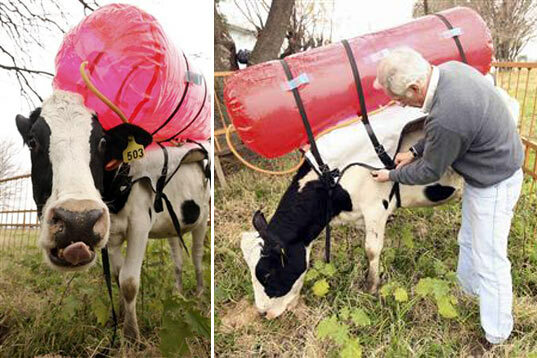 – An Introduction to Global Warming). The diagram below shoes the major contributors to global warming and whether they have a positive effect (a warming – coloured red) or negative effect (a cooling – coloured blue) on the Earth’s climate. The highlighted box shows the contribution from aersols – a very negative effect! However the black lines show how much of this estimation is uncertain. There is a large amount of research currently trying to reduce these uncertainty bars so we can be more sure of how much an overall effect aerosols have on our climate. 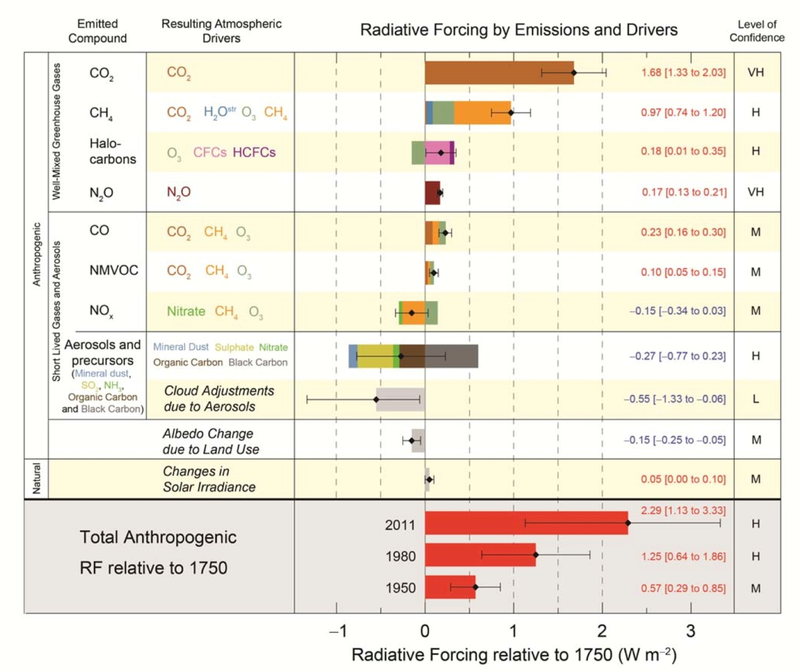 Global average radiative forcing estimates and ranges. Originally produced by the IPCC. There are two main ways aerosols effect our climate. The first is a ‘direct‘ way. I.e through re-radiating energy (warming the Earth) or reflecting incomming sun’s rays back out to space (cooling the Earth). Again, my first post explains this in more detail. The other way aerosols effect our climate is called the ‘indirect effect‘. As aerosols are needed as ‘seeds’ for clouds to form, an increase in aerosols can cause an increase in cloud number thus increasing the Albedo effect. When aerosols help form clouds they are referred to as ‘cloud condensation nuclei’ (CCN). The more CCN present the whiter the clouds can appear which further increases the albedo effect. As you read this you may be thinking, the more aerosols present the better in the atmosphere as they have an overall cooling effect of climate however not all effects of aerosols are good. Aerosols can have a huge impact of air quality and atmospheric pollution. The recent smog events in Singapore (shown in the picture below) are thought to have occurred because of aerosols released from illegal biomass burning from Indonesia and travelling up to Singapore where they formed these smog clouds which can have severe health effects. 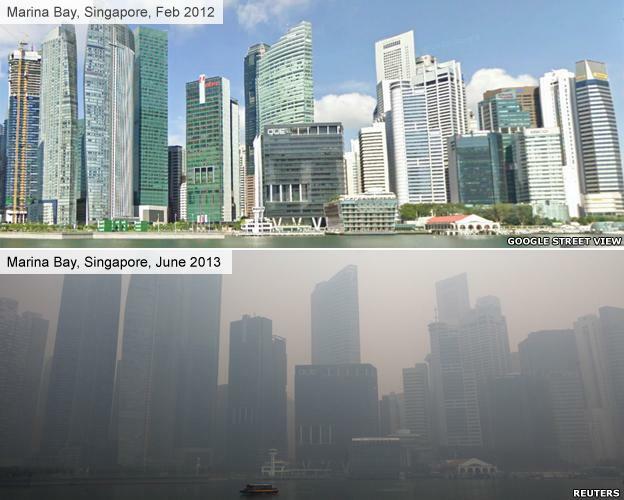 Comparison of Singapore skyline from Feb 2012 and June 2013. Image originally from BBC News website. Any questions or comments please write them below, or perhaps even a request for future posts?? Next time I plan to give a very brief overview of the history of the Earth’s temperature has changed over 65 millions years. They’ll be videos in that one as well!